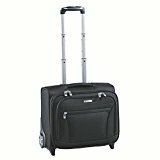 Caribee Ambassador Laptop Trolley Case (Black) This carry on trolley case is one of our best sellers and comes highly recommended by all. The Ambassador carry-on trolley case features:- Padded laptop sleeve; Fits most laptops up to 15.4″ Three stage push button trolley system Oversized free flow wheels Long three stage extendable aluminium handle 27″ (69 cms) Heavy duty SBS #10 size zip (most bags use a #8 zip) for the main compartment. This is a strong zip and designed for use on bags that could be put under stress. Sturdy base feet stabilisers makes sure your case does not topple over Internal filing system; Internal IT accessory pockets Lockable zip housings Domestic carry on size approved The case measures: Length: 42cm; Height: 35.5cm; Depth: 25cm The laptop section measures: Length: 36cm; Height: 28cm; Depth: 4cms Designed for up to 15.4″ (39cm) laptops. Weight: 3.2 kilos; Capacity: 30L approx.